6 Cassettes " THE WAY TO PEAK PERSONAL ACHIEVEMENT "
" TONY ROBBINS GIVES YOU THE UNLIMITED POWER TO SUCCEED "
any self-imposed limitations. You will change how you feel about yourself and discover how to master your daily actions and thus your world. " " Anthony Robbins has accomplished more by the age of 29 than many people do in their entire lives. A self-made multimillionaire, he has been a peak-performance consultant for companies such as AT&T, American Express, IBM and McDonnell-Douglas, as well as the U.S. Army. He is the founder of the science of Neuro-Associative Conditioning Systems (NACS), a powerful, step-by-step process of success conditioning designed to create consistent levels of peak performance. " " He is founder and president of Robbins Research International, Inc., a worldwide network of professionals dedicated to the advancement of the human potential in bio-science, accelerated learning and child development. He has received international acclaim as an author, educator and business consultant and has been interviewed extensively on radio and television, as well as in newspapers and magazines. " 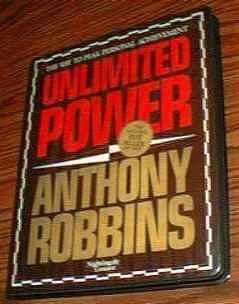 " Anthony Robbins' national best-selling book, UNLIMITED POWER, now published in eleven languages, continues to be a sensation around the world. " " Since 1984, business people, athletes and the general public have all enjoyed the warmth, humor and dynamic presentation styles of his sales and personal development seminars. " " Anthony Robbins has brought the power to succeed and achieve to millions of people around the world, both in person and through his widely broadcast "Personal Power" programs. " © 1986 Sound Ideas, ® an imprint of Simon & Schuster Audio Publishing Div. confidently ... consistently ... with these cassette sides "
12. Metaprograms - Understanding Yourself and Others (Cont'd) "
The cassettes were not tested, but everything looks like they are in very good to excellent condition.